The looming crisis in our social care sector and the shortfall in funding from the Government to cover the expected costs of future social care needs is leading to a change in thinking. 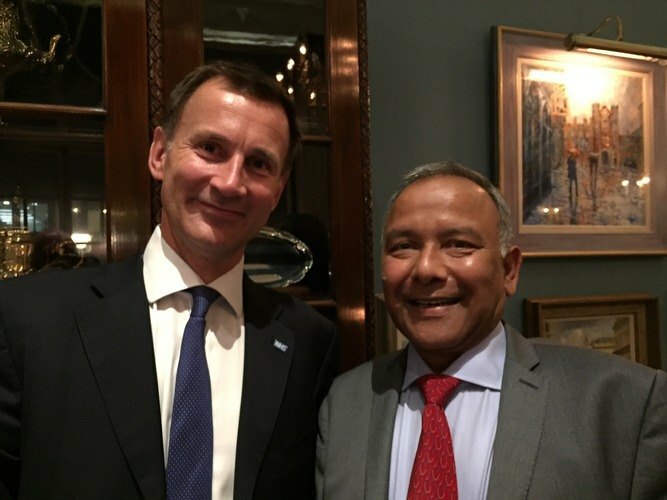 Jeremy Hunt, Secretary of State for Health (pictured above with franchisee Bipin Patel) is in favour of urging people to start saving money not just for their pensions but more importantly for their future care. The plan being discussed amongst some ministers is that people should be encouraged to think twice before spending on costly items such as a cruise or even a new car and rather put that money aside into some kind of savings account, earmarked for their future care needs. According to a recent report in the Guardian, one idea mooted is an Isa-type savings account offering a preferential interest rate for an amount up to £75,000 from which one could withdraw funds to pay for care or even leave it, tax-free, in a Will. Another is for tax incentives to be offered if people wished to withdraw money from their pension funds to pay for their social care. Baroness Altmann, previous Pensions Minister states that encouraging people to save for their costs may be the only solution. However unpopular this proposal may be, it looks to be the most workable solution.Altmann said: "It seems clear that we cannot rely on insurance companies to devise policies that will cover the costs of care for many of the population . We need to encourage people who are already in later life to earmark some of their savings to pay for care, should the need arise. We have been successful in getting people to save in pensions by using tax incentives and I would suggest we need to incentivize care saving too." There are, quite possibly, individuals who have saved money over the years in readiness for their retirement but the danger lies with people not understanding how the social care system works. Ignorance is not always bliss, especially when it means that money spent on lifestyle pleasures could have been saved and used instead for a different standard of care to the basic level offered by the state. People need to be savvy about these issues and start planning now. "An important policy objective should be to help as many people as possible understand the benefits of keeping money aside for later life, rather than spending it early in retirement", Altmann concluded.